Climate Pro® blow-in fiberglass insulation fills those hard-to-reach cavities and corners while offering more consistent coverage and less dust – resulting in a more comfortable, energy-efficient home. It offers R-values ranging from R-11 to R-70, and is quick for professionals to install. 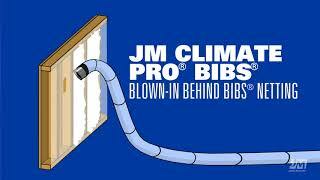 Our Climate Pro® insulation is also used with our Blow-in-Blanket System® (BIBS). New construction, remodels, walls, attics and irregular spaces. Climate Pro® blow-in fiberglass insulation is available exclusively to professionals. If you are interested in having Climate Pro insulation installed in your home, visit our contractor locator to find an experienced JM insulation contractor in your area.